Divers experience various medical problems besides the bends, and many of these problems can look a lot like DCS. While it's easy to connect the dots after a definitive diagnosis, solving the puzzle in real time can be both an art and a science. Join us to better understand common post-dive medical complaints and the factors that help DAN medical information specialists differentiate them. Your undergarments are sweaty from carrying tanks to the dive site, the air is 32°F, and the water is 39°F. You curse the day you promised your buddy you'd go and explore that mountain lake, yet you know you won't regret it once you're in. Cold-water diving is a physiologically strenuous activity that requires special practices and equipment and warrants additional risk assessment and dive planning. Still, more and more divers are doing it and enjoying it. Join us for a brief history of cold-water diving equipment, and see if cold-water diving might be for you. When an injured diver appears for evaluation, the doctor often considers decompression illness first. This is because if DCI is confirmed the patient will need a specific treatment that is time sensitive and not always readily available. Injured divers may have other conditions that urgently need a different treatment and which may be confused with DCI. 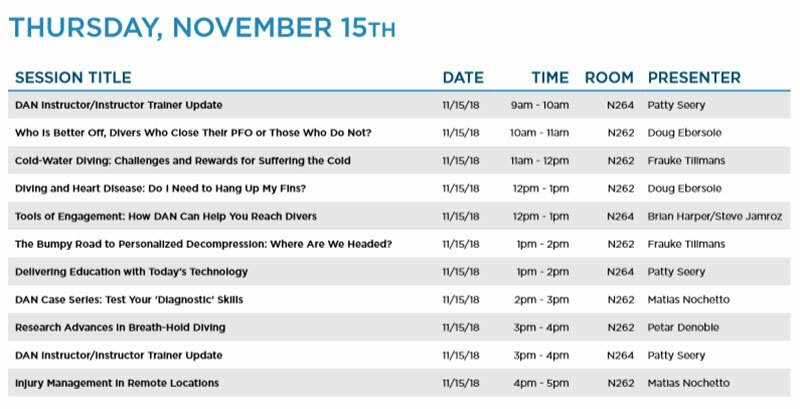 This presentation will bring you excerpts of special interest to dive professionals from the recent DAN/UHMS seminar about differential diagnosis of dive injuries. This review of cases is intended to help dive leaders become better at assessing dive injuries. Thinking critically about real incidents can help dive leaders better recognize and respond to post-dive symptoms. In this interactive seminar we will discuss real DAN Emergency Line cases, figure out what might have gone wrong and learn how to avoid or be prepared for complications in the future. You update your equipment, your website (hopefully) and your teaching materials, but are you keeping up with advances and new opportunities in how you deliver training? Give your students what they came for: skills. It's all about the skills, and today there are fantastic tools available that can make training engaging and fun — and teaching easy. Coronary artery disease is the No. 1 cause of death in the United States. As the scuba diving population ages, this becomes a significant concern in diving. Up to 25 percent of dive fatalities are likely due to underlying coronary artery disease. This talk will cover risk factors for the development of coronary artery disease and who can safely return to scuba diving after stenting or coronary bypass surgery. Additional topics discussed will include diving with pacemakers, defibrillators, rhythm abnormalities, valvular disease and blood thinners. Children can begin scuba diving at very young ages. They have unique physiological features and psychological characteristics that warrant special accommodations. As dive leaders and responsible business owners, we want to be prepared to keep them safe. We review what we know about this vulnerable group of divers and discuss reports to DAN about the injuries they experience. Managing injuries in remote locations is a challenge for precisely the same reason that these areas are unique and appealing to divers: access is difficult. 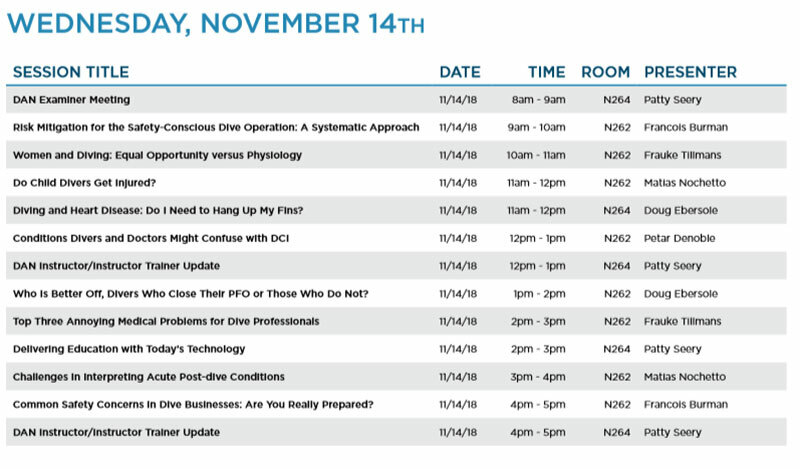 This lecture will illustrate how DAN manages cases in remote dive operations. Selected real cases will promote discussion about preventive measures and emergency preparedness. While it seems a simple and intuitive physical activity, breath-hold diving has numerous physiological effects. Studying short- and long-term adaptations to breath-hold diving helps divers improve their performance and safety and helps physicians understand some illnesses that involve similar mechanisms. Extreme breath-hold diving may have both acute and chronic detrimental effects on divers. Recent studies provide new insights into these issues. Dive operators play a critical role in ensuring the safety of their clients and, just as importantly, the safety of their staff and their business. Being proactively aware of the risks in your operations can reduce the frequency of incidents and ensure preparedness for accidents and emergencies. The DAN Hazard Identification and Risk Assessment (HIRA) program provides guidance and education on the many risk factors present in the business, during dive operations and at dive sites. Marketing your business across today's digital channels doesn't have to be complicated. With photos, the occasional video and a splash of personality you can build a community of divers who are excited about what you're doing. DAN can help you keep your audience engaged. Learn how you can leverage our extensive library of informative and authoritative content for the benefit of your divers and your business. Attendees receive a selection of mission-based content to jump-start your marketing efforts. Dive professionals, whether working on liveaboards or the house reef, deal with various medical problems that make diving less enjoyable — both for themselves and their divers. Asking around the diving community, we found the following annoying medical issues associated with a diving lifestyle to be common: seasickness, cramps and gastrointestinal distress. We'll examine these ailments and investigate what advice current research offers to prevent or cope with these problems. Patent foramen ovale (PFO) is present in 25 percent of the population and puts scuba divers at an increased risk of decompression sickness. This talk will examine this risk and how to mitigate it by either diving more conservatively or undergoing percutaneous (nonsurgical) closure of the PFO. 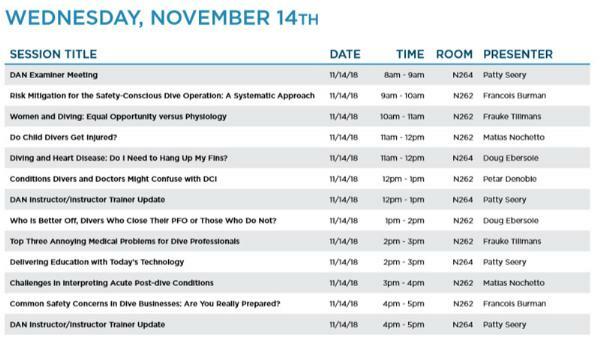 Additionally, we'll discuss the results of a recent DAN-sponsored study that compared PFO closure and conservative diving. Many dive operators believe an emergency action plan is either a generic slate covering all possible medical emergencies or, "just call DAN." No two operations are the same; not only do the services offered vary, but every dive environment introduces its own unique challenges. Realizing during an emergency that your plan needs a backup, that it just won't work under actual conditions, or that you lack appropriate training or equipment might cause even the most experienced operator to panic. Knowledge in advance enables you to be prepared for even the most serious and unexpected of accidents. Women's anatomy and physiology is of course different than men's. Women are generally considered less strong but more flexible, and there are differences in risk awareness, body composition and hormones. How relevant this is to scuba diving and what it might mean for decompression is not well studied. We'll look at the differences that have been explored in physiology and psychology research, and we'll draw some conclusions about equal opportunity underwater.